The historic stone buildings in Place-Royale in Old Quebec in Quebec City, Canada bring out the true heritage of the area. Place-Royale is a unique place where old historic buildings constructed of stone, line the street and bring out the real beauty of Old Quebec, Canada. A man sits on the stairs in front of the buildings soaking up the sunshine and a street side cafe fills the corner area. 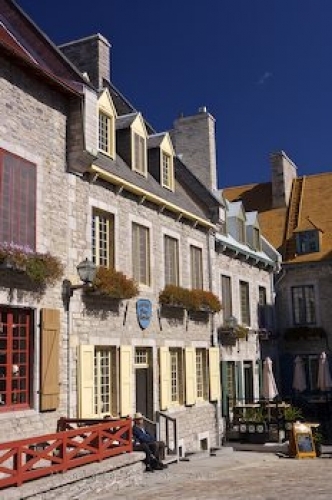 Old stone buildings in Place-Royale in Old Quebec, Quebec City, Quebec, Canada. UNESCO World Heritage Site. Picture of a row of historic stone buildings in Place-Royale in Old Quebec, Canada.